Six months ago, we announced that we acquired the best SMTP plugin for WordPress. Our goal: Make it easy to solve the email deliverability problems that the entire WordPress community faces. After months of development, we’re excited to share with you that WP Mail SMTP 1.0 is nearly ready! Before the release, in the interest of transparency, we wanted to give all WP Mail SMTP users a heads up on what’s coming. 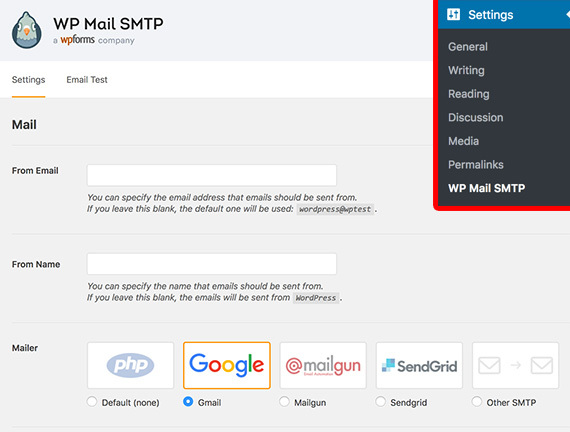 WP Mail SMTP 1.0 – What’s New? This is no ordinary update. In fact, we’ve spent the past 6 months completely rewriting the plugin from the ground up, using modern standards and practices and adding new features. But don’t worry – if you’re currently using WP Mail SMTP on your site, rest assured it will continue to work as normal. After updating, you won’t even notice a difference until you check out the settings page. …and several new options for securely enabling SMTP on your site – quickly and easily. Previously the only option was to set up SMTP using your Gmail, Yahoo or Microsoft Live/Hotmail/Outlook email account. However, this method is less secure because it stores your email login and password in your WordPress dashboard, where other WordPress administrators have access to it. In other words, WP Mail SMTP will now do the job of 4 plugins in 1. The non-SMTP methods will be more secure, since you fill in your API key and other info without having to store a password in plaintext. Now we’ll actually have native integrations with those providers. That means if your web host is blocking the common SMTP ports, which is common, you can use any of those other services to bypass the problem. Plus, support for these providers was built in a modular way. This means in the future it will be easy for us (or other developers) to add support for other popular providers such as Postmark, Amazon SES, and more. When Is the Launch Planned? We’re planning to release WP Mail SMTP 1.0 release next week, so stay tuned and be ready to update! Thanks for all your support! We’re excited to bring you these new features and look forward to developing more soon. Thanks for your support, Asanatlar! This is awesome. Great work!! look forward to the updated plugin. I have used it on many sites over the years and it is such a life saver. Thanks so much, Julian! Happy it’s helping you out 🙂 Do let us know if you ever have any suggestions to improve it further. I’m uding WP Mail SMTP for my site https://standavietnam.net/ . Very good! Thank DEV Team so much..
Let us know how it goes, Presley! For more details on both of these, please see our tutorial on how to set up WP Mail SMTP. Last, if neither of these seem to be the issue I would recommend next contacting your site’s hosting provider (they may be blocking the port you need). Awesome can’t wait for it! Thank you guys for making it happen! Aces! Terrific news but really hope you consider Amazon SES in the near future. Would also be great to have features to add a header and footer/signature to all outgoing emails. Thanks for the suggestions! We’re keeping our options open to add additional mailers like Amazon SES down the road, though for now we’re going to mainly focus on the providers mentioned here. As far as headers and footers, this is an interesting idea — though the challenge is that many emails that go out from your site (including our WPForms form notifications) already include these. We’ll keep that idea in mind, though! Would there be a way to include a SSL cert to have the mails it send out to be certified and trusted? Great question, however SSL certification for emails is actually configured via your server, by your site’s hosting provider. So if you’d like to get this in place, the best next step is to reach out to your host for more details. I have used this plugin and recommended it for so many years, it was simple and got the job done, but with email services (google in particular) preferring API and OAuth it has become less useful. It’s great to see that it’s coming with some new updates, and look forward to recommending it again! Will the Google option be using OAuth? Yes, that’s correct — our Google option will be using OAuth. So it’ll require some extra steps to set up within your Google account, but will be much more secure than the current method (though the old method will still work as well). Hi, can you tell me what will happen to websites that currently use WP Mail SMTP with Pepipost? What will happen if we upgrade the plugin? Will everything continue to work as normal, or will it break? Don’t worry, everything will continue to work normally when you upgrade — even if you’re currently using Pepipost. Our team has carefully designed the update so that anyone already using Pepipost will be able to continue with that as a main option (no changes needed) — and if you’d like to use it on any new sites, you can still do so by using our “Other SMTP” option (shown in this screenshot). Is this plugin still work with zoho.com/mail ? Absolutely — any SMTP settings that you already have in place will continue to work just the same. So while you’re welcome to switch to one of these new, more secure methods if you’d like, you can also continue using your current options (no need to change anything). Looks like a great update. Are you planning on including Pepipost integration? You can absolutely use Pepipost if you’d like, however we’re no longer offering that as one of the main options. So if you already have Pepipost in place, it’ll continue to operate just as before (no changes needed). And if you want to use Pepipost on a new site, you can do that by choosing our “Other SMTP” option. Good job guys! That are awesome features! This plugin is the best! Thanks!! Maybe consider adding mailjet as an option. Thank you for this – really excited about the provider integrations, as that will alleviate the concerns re: password exposure in the admin dashboard. Absolutely, the security issue was the highest priority for us to address in this update. Please be sure to check in after the update rolls out and let us know what you think! I am a web designer. I use your plugin on hundreds of websites. Thank you so much. Suggestion for the app: Would love to have a setting that allows the plugin to send me a test message on designated basis. I’ve had some sites with problems with sending emails. If I could get a weekly (for example) email from the site, that would make it easier to keep an eye on it. I had a site that had a lot of intermittent issues that drove me crazy but my only option was to remember to keep checking to see if the plugin was still working. I’d like to know there is a problem before my clients do. Thanks! Good news on the upgrades, I am pleased to find also wpforms. Got this one in my to do list. thanks again. Many thanks to you for your work! We are looking forward to the release of a new version of the much needed plug-in! My server has a limit of 800 emails per hour that can be sent out, can we set a hourly limit or throttle the emails sent out some way? Can we cache the emails and send them via a WP crone job in some way? To solve a limit issue like this, we’d recommend you look into an email sending service such as SendGrid or Mailgun. These are designed to handle very large email needs like you’re describing. It is very intrusive and disturbs our work. How can it be removed please? Thanks for reaching out. We appreciate your support! You should be able to dismiss the notice by clicking one of the buttons in the message. If for some reason that isn’t doing the trick, there may be a conflict on your site with the AJAX we use to dismiss the message. I really apologize for this. Rest assured we definitely don’t want to intrude or annoy our users. If I use the SMTP option on the new release is the password still stored in plain text? In the next version the password will not show in the settings page (it will be a password field, so it will show *****), however because the password has to be sent to the SMTP host in plain text, it is still stored in the database as plain text. I’ve created beautiful forms using WP plugin, also installed WP Mail SMTP as per your earlier blog suggestions. Although after several tests I noticed that I’m not receiving email notifications that someone filled in my form. Probably the solution is quite obvious, but I’m struggling for a few hours already. If you’ve followed our tutorial and have set the From Email in your notification settings to the same email you set the SMTP with, it’s likely a server issue. As a next step, I’d recommend getting in touch with your site’s hosting provider. Sometimes a host will block the ports that SMTP needs by default, which can prevent the SMTP from working. If you give this a shot and still have questions, please let us know. Here are links to our paid plugin support or to our Lite version support forum.